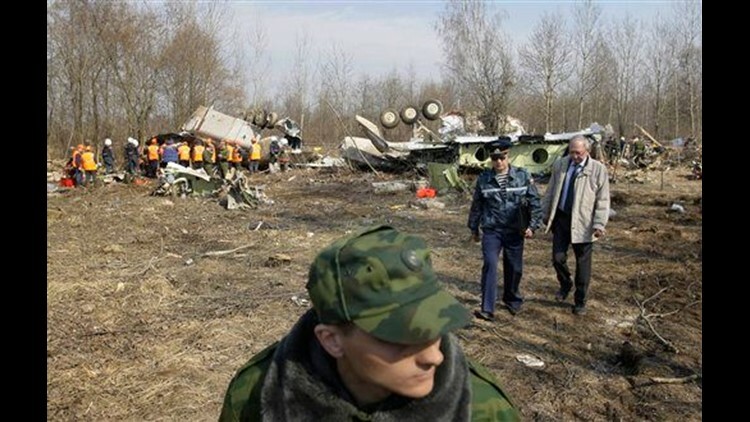 WARSAW, Poland (AP) — Russian investigators suggested human error may have been to blame in the plane crash that killed the Polish president and 95 others, saying Monday there were no technical problems with the Soviet-made plane. The Tu-154 went down Saturday while trying to land in dense fog near a Smolensk airport in western Russia. All aboard were killed, including President Lech Kaczynski and dozens of Polish political, military and religious leaders. They had been traveling in the Polish government-owned plane to attend a memorial in the nearby Katyn forest for thousands of Polish military officers executed 70 years ago by Josef Stalin's secret police. The pilot had been warned of bad weather in Smolensk, and was advised by traffic controllers to land elsewhere — which would have delayed the Katyn observances. He was identified as Capt. Arkadiusz Protasiuk, 36, and the co-pilot as Maj. Robert Grzywna, 36. Also in the cockpit were Ensign Andrzej Michalak, 36, and Lt. Artur Zietek, 31. In Warsaw, there was concern the pilots may have been asked by someone in the plane to land at Smolensk instead of diverting to Minsk or Moscow, in part to avoid missing the ceremonies. Polish Prosecutor General Andrzej Seremet said Polish investigators talked to the flight controller and flight supervisor and "concluded that there were no conditions for landing." "The tower was advising against the landing," Seremet said. The plane was equipped with an instrument landing system, or ILS, said Col. Wieslaw Grzegorzewski of the Polish Defense Ministry. "I can confirm the pilots were preparing for landing without the ILS system," he said. "The airport didn't have the ILS system." Russian media reports said the Smolensk airfield is a former military air base that lacks equipment for automatic landings. The business daily Kommersant said Monday that about 50 military personnel maintain the airport which is used only sporadically for official visits. It said the airfield has no permanent traffic controllers, and they are brought from the city of Tver when it's necessary. Kommersant also said that that the pilots had been informed about the bad weather in the area while the plane was still over Belarus, but the captain said he would see conditions for himself and then make a decision. Polish investigators said they will listen to the cockpit conversations recorded on the black boxes to see if there were "any suggestions made to the pilots" from other people aboard the plane. Other Russian officials said the pilots were offered the chance to land in Moscow, Minsk or Vitebsk, but they chose Smolensk, despite four failed attempts before the fifth and fatal approach. Polish media reported in August 2008 that pilots flying Kaczynski to Tbilisi refused the president's order to land there because of the country's war with Russia, diverting instead to Azerbaijan. In remarks on Russian television, Deputy Prime Minister Sergei Ivanov told a government meeting including President Dmitry Medvedev that the data recorders on the plane were found to have been completely functional, which will allow a detailed analysis. "It is reliably confirmed that warning of the unfavorable weather conditions at the North airport and recommendations to go to a reserve airport were not only transmitted but received by the crew of the plane," he said. Russian investigators have almost finished reading the flight recorders, said Alexander Bastrykin, Russia's chief investigator. "The readings confirm that there were no problems with the plane, and that the pilot was informed about the difficult weather conditions, but nevertheless decided to land," Bastrykin said during a briefing with Russian Prime Minister Vladimir Putin in Smolensk. The wreckage will remain on site through midweek to speed the investigation, Russian Deputy Transport Minister Igor Levitin said. In Warsaw, the acting president, Bronislaw Komorowski, moved Monday to start appointing replacements for the many posts left vacant in the presidential office. He appointed a retired general, Stanislaw Koziej, as new National Security Bureau chief, and said the first task he was setting him was a review of the rules for travel of top military officials. Both Russia and Ukraine declared a day of mourning Monday, as Poles struggled to come to terms with the tragedy that eliminated so many of their government and military leaders. Tens of thousands watched as Kaczynski's body, returned Sunday to Warsaw, was carried in a coffin by a hearse to the presidential palace. His twin brother, Jaroslaw Kaczynski, the former prime minister, was present. Adam Bielan, an aide to Jaroslaw, said the two brothers spoke briefly Saturday morning when the president called his twin just before the plane crash to say they would be landing soon. At U.N. headquarters in New York, the U.N.'s blue and white flag flew at half-staff Monday in Kaczynski's memory. U.N. Secretary-General Ban Ki-moon expressed his "most profound condolence at such a tragic passing away of President Lech Kaczynski, with whom I have been working very closely, especially on climate change." An annual Holocaust memorial event at Auschwitz-Birkenau on Monday was honoring Kaczynski and the other victims. Organizers of the March of the Living — with some 10,000 Jewish youth marching over about 2 miles (3 kilometers) between the two parts of the former Nazi death camp — said those marching would also remember those killed in Saturday's crash. Forensics experts from Poland and Russia were working to identify other bodies, including first lady Maria Kaczynska, using DNA testing in many cases. Jacek Sasin, a spokesman for the Presidential Palace, said Kaczynska's body would be sent to Warsaw on Tuesday. He said the bodies of the first couple would lie in state at the palace beginning Tuesday, their coffins closed, and the public would be permitted to view them. "We want every Pole who wants to pay tribute to the president, to be able to come and stand by the coffin," he said. Sasin said officials are now planning the funeral for Saturday but a final decision depends on when the bodies of all 96 victims are returned home. So far, 87 bodies have been recovered. Medvedev has said he wants to attend, according to Polish Foreign Minister Radek Sikorski. Sasin said nothing has been changed in the living quarters of the president and his wife since they were there for breakfast Saturday. "I don't think there is anyone who would want to change anything there. We still cannot believe what has happened," he said. Among the victims Saturday was Ryszard Kaczorowski, 90, the last leader of Poland's exiled government in London. The exile leadership was established during the Nazi occupation of Poland and continued to declare itself the rightful government during the decades of communism, until Lech Walesa became Poland's first popularly elected president in 1990. The crash also took an icon of Poland's Solidarity freedom movement, 80-year-old Anna Walentynowicz. Workers at the Lenin Shipyard in Gdansk went on strike when Walentynowicz was fired from her job as a crane operator in August 1980 for her opposition activity. That sparked strikes that spread to other plants across the nation, giving rise to the movement that helped bring about the demise of communism in Poland nine years later. Also aboard were the army chief of staff, the navy chief commander, and heads of the air and land forces, the national bank president, the deputy foreign minister, the army chaplain, the head of the National Security Office, the deputy parliament speaker, the Olympic Committee head and at least two presidential aides and 17 lawmakers. Associated Press Writer Vanessa Gera contributed to this report.